I can't seem to find food grade lye anywhere. I've looked in health food stores, pharmacies and in international food shops. I can tell you where to find pro-biotics, feta from Bulgaria and bone marrow, but lye? Nope. The big supermarket chains, of course, I skipped looking in entirely. Someone told me recently that Mexican grocery stores stock food grade lye. I guess I'll have to find out what 'lye' is in Spanish and go on the hunt. Before that, however, I'm happy to say that our local German market stocks a pretzel mix (just add oil and water!) for lazies who can't be arsed to follow an actual recipe. Normally, I wouldn't go for that sort of thing, but this mix comes with 10g of food grade lye. The magic ingredient has been found. The pretzel prep is pretty basic: mix yeast, flour, and water until it forms into a ball. Let the dough stand for thirty minutes before rolling it out into a 'loaf'. Cut the dough into 8 to 10 pieces, then shape accordingly. 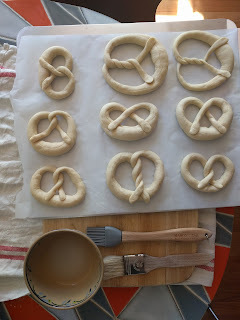 Brush the pretzels with the lye solution and let stand another twenty minutes before baking. Easy-peasy. 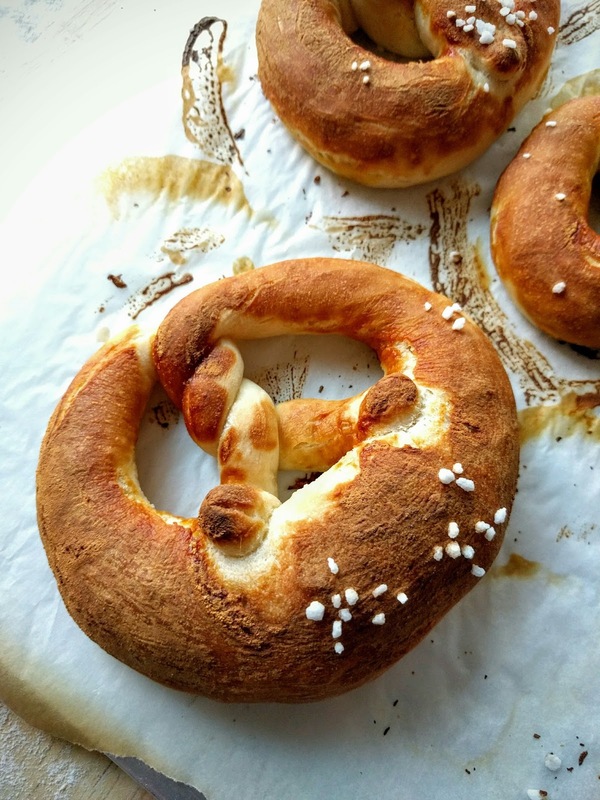 The lye didn't quite do its thing and the pretzels came out with a matte appearance instead of the lovely sheen one associates with Brezeln from the Fatherland. I can't say I was wholly disappointed in that the pretzels were still fairly chewy and had just a slight crunch when biting into them. All the old grannies used lye to make soap both for washing self and clothes. I used to regularly find it and when it disappeared, I was told lye was being controlled by the government nowadays as it could be used in making bombs.?? Yes, I remember lye being used in making soap! Weird that it should be coveted by the gov't for bombing-making. I hope that that isn't true. -must get to the Mexican markets and see if they sell lye for soap-making purposes. I would also try the farm and feed stores. They have foodstuffs too. And I had no idea that lye was the secret ingredient. It's all about the lye! :D We brought a batch to a Superbowl fiesta & they were a hit. Looks good, sadly I don't even know what lye is!! Yeah, D, food grade lye produces a sort of sheen across the top of the pretzel. The result is that the pretzel is a bit crunchy on the outside, but soft and a bit chewy on the inside.